Pictured from left are YMCA Early Childhood Program staff Teresa Wilkinson, Sonya Stonerock, and Archer Thomas. 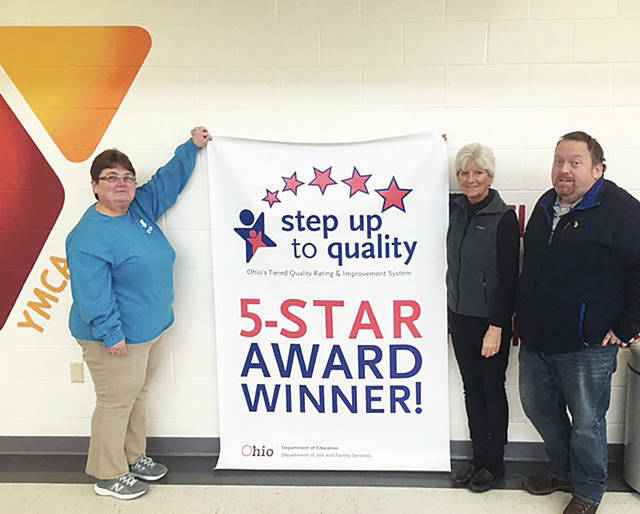 The state of Ohio recently awarded the Champaign Family YMCA a 5-star rating for meeting the quality standards established by the Ohio Department of Job & Family Services and the Ohio Department of Education. “I’m extremely proud of our infant, toddler and preschool staff for embracing our Y’s ongoing steps to provide top-notch child care,” said Sonya Stonerock, the Champaign Family YMCA’s Child Care Services director. Programs awarded the Step Up To Quality (SOTQ) designation go beyond state of Ohio licensing requirements to better serve the needs of young children and their families, and to prepare them for success in kindergarten and beyond. A 5-Star SUTQ rating is the highest level in the state of Ohio. Research into human growth shows that 90 percent of brain development occurs before age 5, so early childcare and education is crucial to a child’s future success. Early learning builds the foundation for skills needed in school, work and life. Studies show that children who receive quality early childcare and education are more likely to show improved reading and math skills, attend college and earn higher wages, according to information from the state agencies awarding the 5-star rating. “It is crucial that providers and educators across the state have a mutual understanding of what quality looks like in the child care environment and that they are supported on their path to quality,” said Archer Thomas, SUTQ Coach. According to information from the state and the YMCA, early childhood programs enrolled in Step Up To Quality have access to coaching and resources that enable any provider – big or small – to take quality to the next level. The Champaign Family YMCA is celebrating its 20th anniversary this year.